Kansas WORKReady! Certificate - Southeast KANSASWORKS, Inc. The Kansas WORKReady! Certificate is a nationally recognized, letting EMPLOYERS know a job candidate’s skills before they even walk into the interview. JOB SEEKERS present their Bronze, Silver, Gold or Platinum Certificate to EMPLOYERS as proof of skills in reading, locating information, and mathematics. You know you’re talented. You know you can do the job better than anyone. You just need a chance to prove it to employers. 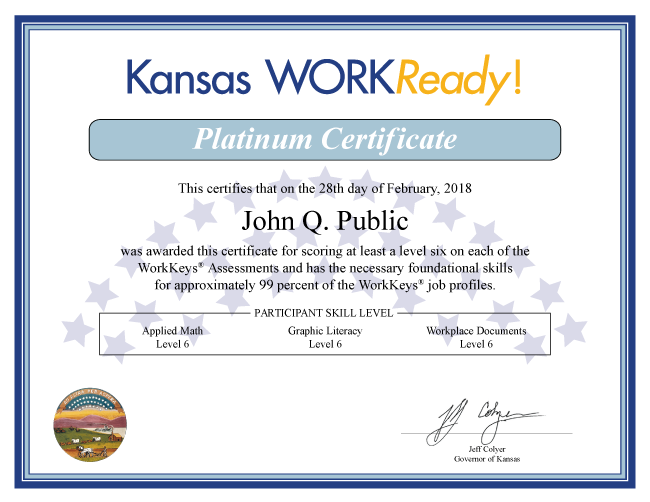 The Kansas WORKReady! Certificate can help! Can I practice before taking the assessment? You can schedule a practice session or review your skills before taking the assessment by using the WIN e-learning tutorial system. WorkKeys® is a reliable and nationally validated system evaluating and analyzing workplace skills. Thousands of jobs are “profiled” to identify skill levels necessary to perform each job. Skills measured by WorkKeys® are transferable skills – skills necessary for most jobs. Tasks are based on workplace situations and do not require job-specific knowledge. What do the four different Levels of the Kansas WORKReady! Certificate mean? Bronze Level – Core skills for approximately 30% of the jobs profiled by WorkKeys. Silver Level – Core skills for approximately 70% of the jobs profiled by WorkKeys. Gold Level – Core skills for approximately 90% of the jobs profiled by WorkKeys. Platinum Level – Core skills for approximately 99% of the jobs profiled by WorkKeys.